During PAX Prime 2015 SPOnG's Chris O'Regan met with Ben Dowie, the Product Manager at Frontier Developments and Executive Producer for Elite Dangerous. Ben spoke to Chris about the development of the expansion as well as its current state. 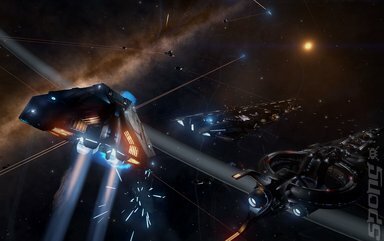 SPOnG: Could you tell us what the key bullet points of the Elite Dangerous: Horizon expansion are? Ben Dowie (BD): Sure, well there is planetary landings, which is a combination of many things. It's the seamless transition from open space to the planet's surface of airless worlds. It's about being able to fly across a planet really near to the surface, and you get a completely different flight model where the gravitation of the planet kicks in. 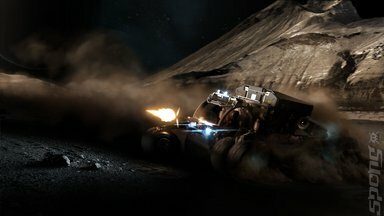 It's about being able to use the SRVs, which are Surface Roving Vehicles. They are effectively like buggies [and] you'll be able to go through the ravines, make jumps off of the surface, and you'll see little glimpses of the kind of the spirit of that in our little teaser trailer that we dropped. We'll have settlements on planets that you can attack and defend. There is loot, which you can find in these places. Then you've got the awesome combination of all these things together. It's one of these things we try to get across in our releases where you can see the SRV just in the main view and you can see the settlement in the background and you can see the Cobra flying in across above it. All of these levels interact together, so you can actually be trying to take out a buggy on the surface with old-school-like WWII sweeping runs. This is because you can't lock onto those bad boys on the surface. But you can also be working in a wing together, so you might actually go and scout out a settlement. You then communicate back to your guys so you don't want to just send them in if there is anti-aircraft on that settlement. It's all about choosing, combining and trying to get these different experiences together. For me it's a whole new dimension with the gameplay and I'm just super excited to get it out for everyone. 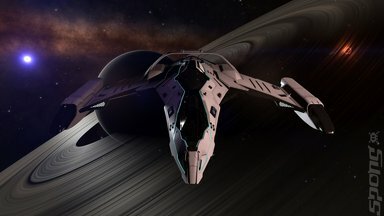 SPOnG: How are the myriad of factions within Elite Dangerous going to be impacted in Horizons? BD: Throughout this season we're going to be adding more to power play, we're going to add more depth to how we add story and narrative to the game. We're going to try and make it more meaningful. Obviously opening up new options to things that are in the game means we can add more depth to that. There are going to be what I call 'collateral benefits for everyone'. So with Season 2, which is effectively when Horizons appears, everyone is going to be benefitting in certain ways. It's impossible to avoid, but it's also a brilliant thing. Playing off of factions is what we refer to as power play, and many players love that aspect of Elite Dangerous. It might be that we make a tiny change to the GUI as part of our update to Season 2, but it's something that's hugely significant to a whole bunch of people. Sometimes the little things are the most important bits. SPOnG: It's greater than the sum of its parts. BD: Yes, yes definitely. So we've already built an entire galaxy, our galaxy. Now we're just trying to put all of that content and gameplay and fill it up and flesh it out. That's kind of reflective on Elite Dangerous as a whole. It's going to be many, many years of content updates adding more richness, adding more quality, adding more little things to do in there to open up your choices. So obviously we want people to play their own way, we want people to do be able to do what they want to do. It's all about adding richness to what is a huge canvas effectively.